Life is full of surprising, joyful moments—moments worth remembering. The D3300 makes it fun and easy to preserve those moments in the lifelike beauty they deserve: stunning 24.2-megapixel photos and 1080p Full HD videos with tack-sharp details, vibrant colors and softly blurred backgrounds. With its included zoom lens, the new ultra-compact AF-S DX NIKKOR 18-55mm f/3.5-5.6G VR II, the D3300 is a small and light HDSLR and easy to use, too. Like sharing photos? The D3300 photos can appear instantly on your compatible smartphone or tablet for easy sharing with the optional WU-1a Wireless Adapter*! Whether you're creating high-resolution panoramas, adding artistic special effects or recording HD video with sound, the D3300 will bring you endless joy, excitement and memories—just like the special moments of your life. Taking snapshots with a smartphone is convenient, but are those photos good enough for preserving precious moments? The D3300's new EXPEED 4 lets you shoot at high speeds up to 5 frames per second, shoot in low light with high ISO sensitivity, create high-resolution panoramas and much more. Your 24.2-megapixel photos and 1080p Full HD videos will be so impressive, so rich with detail† and color—so lifelike—they'll bring back the feelings of the moments they capture. †Exquisite detail reproduction realized by an image sensor unit designed without an optical low-pass filter. Attach the optional WU-1a Wireless Adapter and marvel as the photos you take with the D3300 instantly appear on your compatible smartphone or tablet±. Share your favorite shots without missing a beat—text them, email them, upload them to your favorite social networking sites—it's your choice! You can even use your compatible smartphone or tablet as a remote monitor for the D3300. See what the camera sees and fire the shutter, perfect for self-portraits and group photos that actually include you. Using the D3300 is super easy—and a blast. Can't get the whole scene into your frame? Turn on Easy Panorama Mode and pan across the scene—the D3300 will capture the entire view as a high-resolution panoramic image. It's that easy! Guide Mode gives step-by-step help when you need it (it's like having an expert at your side), and you can easily get creative with built-in Image Effects, filters and more. 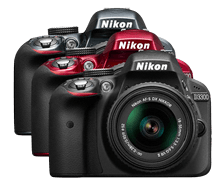 You even get to choose which color you want for your D3300—black, grey or red! 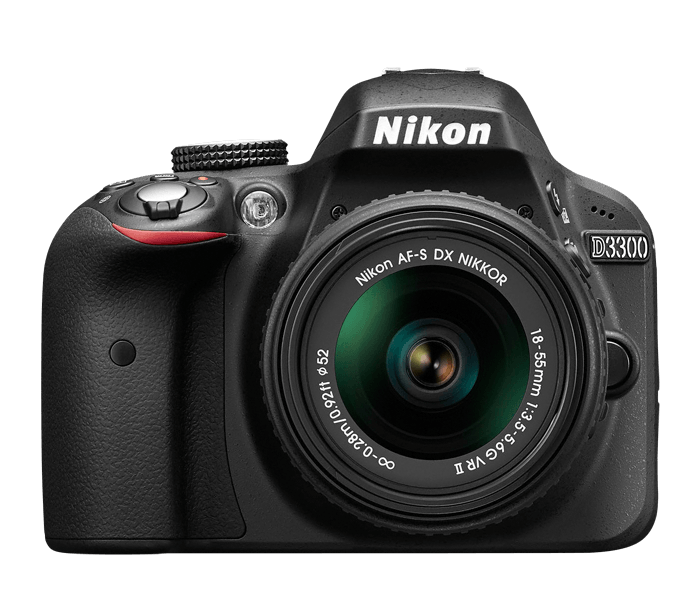 The D3300 is a small and light HDSLR camera even when paired with the included AF-S DX NIKKOR 18-55mm f/3.5-5.6G VR II lens, which has a new ultra-compact design. The combination is designed to fit comfortably in your hands, and all of the D3300's buttons and dials are positioned for convenient, efficient operation. You'll take the D3300 everywhere you go, which means you'll bring home all the beautiful memories of your activities. Like all DSLR cameras, the D3300 has an optical viewfinder that gives you a true view through the lens of the camera—and what a view it is! If you've been using a point-and-shoot camera, you'll find it easier to frame your shots, follow moving subjects, zoom in on bright sunny days and more. When the action starts, hold down the shutter button to capture every movement, expression and feeling at 5 frames per second—that's 5 beautiful photos for every second of action! You won't believe some of the moments you'll catch thanks to Nikon's new high-speed EXPEED 4 processing engine. The D3300's 11-point Autofocus System locks onto your subjects as soon as they enter the frame and stays with them until you catch the shot you want. Even fast-moving subjects are captured with tack-sharp precision. And when you're recording Full HD video, Full-time Autofocus keeps the focus where you want it. The D3300 doesn't only take great photos, it takes dazzling 1080p Full HD video with sound, too! Record smooth, ultra-sharp HD movies you can play back on your HDTV or upload to video sites. You can even apply those fun special effects for more creativity! The D3300's Active D-Lighting preserves the details and tones in both the bright and dark areas of your photos, so shadows are no problem. A new D-Lighting setting in the Retouch menu provides optimal correction for portraits, highlighting your subject against an evenly lit background. Even if you're new to DSLR photography, getting great results in difficult situations couldn't be easier—just select from 6 common Scene Modes for your situation, or switch to Full Green Auto Mode and let the camera pick for you. Make your photos even more impressive with the D3300's Retouch Menu. Easily crop in on your subject, alter the coloring, add special effects and more right in the camera—no additional software needed. Easily shoot in Black & White, enhance the intensity of colors, optimize the tones for flattering portraits and more with Picture Controls. Select one of 6 presets or create your own. The D3300 is compatible with Nikon's complete collection of legendary NIKKOR lenses and optimized for AF-S DX-format NIKKOR lenses. Every lens offers a unique view of the world. Have fun growing your own collection. This camera’s Wi-Fi® capability using the WU-1a Wireless Mobile Adapter can only be used with a compatible iPhone®, iPad®, and/or iPod touch® or smart devices running on the Android™ operating system. The Wireless Mobile Utility application must be installed on the device before it can be used with this camera. AF NIKKOR for F3AF not supported. AF-S, AF-I: All Functions Supported. Electronic rangefinder can be used if Maximum Aperture is f/5.6 or Faster. IX NIKKOR lenses cannot be used. Other AF NIKKOR: All Functions Supported Except autofocus and 3D Color Matrix Metering II. Type G or D AF NIKKOR: All Functions Supported Except Autofocus. Type D PC NIKKOR: All Functions Supported Except Autofocus and some Shooting Modes. This product is currently unavailable for individual sale.